"The Definitive Guide To Accepting, Setting Up & Processing Online Payments Overnight On A Shoe String Budget"
Through This New Report You Can Learn How To Quickly & Easily Start Accepting Online Payments With No Head Aches! If you've been interested in starting your own web business but are worried about how you are going to be able collect payments on the Internet, this guide will show you the easy road to making it all possible. The fact is, you MUST accept credit cards on the Internet today because 95 or more of your sales are going to come from this payment option. It's a fact, everyone uses credit cards. You absolutely must get on the band wagon or you're going to lose 95 or more of your potential sales! Until now, there really hasn't been a tell all guide that explains everything about credit card processing in an easily digestible format. That's a reality using a very easy to follow plan that shows you how to bypass all of the stress of trying to "learn on your own" by showing you the clear, quick & easy path to getting setup in under 24 hours. That I've Personally Uncovered For You! In Virtual Plastic You're Going To Learn The Exact System of Setting up and Accepting Credit Cards Dirt Cheap And In Under 24 Hours! 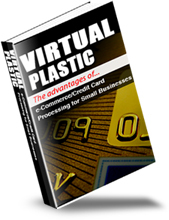 Virtual Plastic is an informative new manual that is going to teach you how to blast through all of the clutter and get right to the meat and potatoes of setting up online payment processing. So What's In The Manual? Why Accepting Credit Cards Could Increase Profits By As Much As 95! Here is a full table of contents of what you are about to learn! 20 Articles On E-commerce Shopping Carts - With Plr + Bonus!